If you haven't already heard, recent studies conducted within the past few years have shown that chocolate milk (preferrably skim) is the BEST post-exercise drink for rehydration. The added protein, sugar, and carbohydrate combination balance the body's fluid intake far better than water or popular sports drinks. I believe the impact this study has on women's health is that we will all have stronger bones and less injuries. Many adults with children, myself included, make the conscious effort to consume other drinks such as soda, sports drinks (Vitamin Water Zero in Orange is one of my fav's), or water after working out and save the "good stuff" for the kiddos. Unfortunately, many of us begin suffering more injuries such as pulled hamstrings, hip flexors, rotator cuffs, and plantar fasciitis pain because we aren't getting enough of the essential vitamins and nutrients in our bodies each day. Building a strong bone structure is core to our physical being, especially if we have kiddos. Doesn't it make sense to drink something that tastes good AND offers the best vitamin and nutrient source possible post-workout ... I definitely think so! What this doesn't mean is that we should down a quart of chocolate milk each day or stop drinking water. Keeping in mind that one serving of each is 8 ounces, it's important to pay attention to how much sweat you worked-up and balance it out with liquid. In the world of health and fitness, according to the National Exercise Trainers Association, "Most adults need at least 10, 8 ounce, glasses of water per day." Post-workout, "Exercisers who sweat heavily should drink 16 ounces of water for each pound lost during exercise." Of course, doing so requires that you (1) know your weight prior to exercise and (2) weigh yourself without clothing each time. As women we must believe in our self-power and adopt a mantra that propels us forward in a positive direction. That does not mean we should push our bodies to their physical limits, but rather create personal space in our minds for acceptance and change. Be the person you want to be every single day! 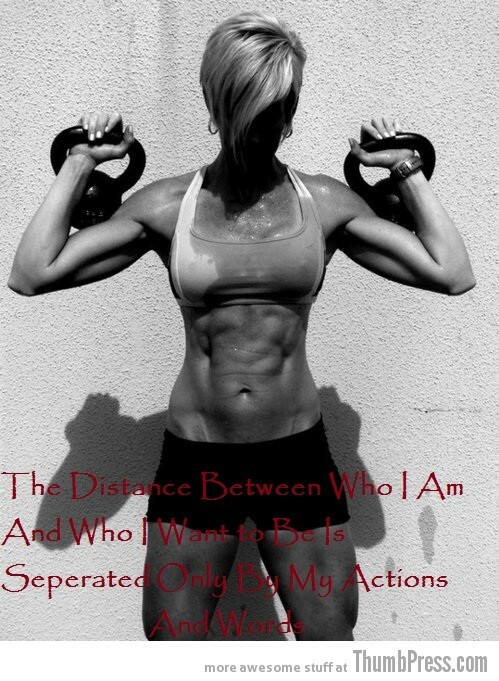 The distance between who I am and who I want to be is separated only by my actions and words.